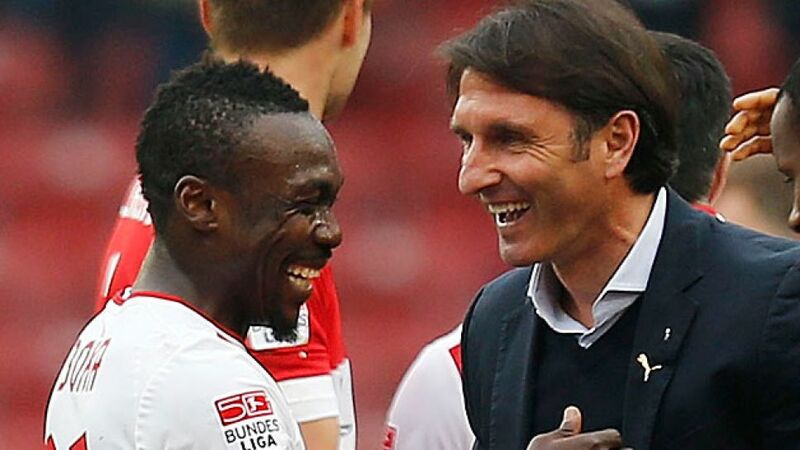 Labbadia: "I've given the players the day off"
Bruno Labbadia (VfB Stuttgart): I know how important this game was so I've given the players the day off on Monday. I hope the lads enjoy it and have fun. We couldn't have hoped for a more perfect week. Christian Streich (SC Freiburg): We played well and were an equal match for them, but they were the ones who ended up scoring. We picked ourselves up really well after going out of the Cup and I can't criticise anyone here. Michael Wiesinger (1. FC Nuremberg): The defeat hurts a lot. It's frustrating that our run at home ended in a derby of all games. We had chances and a lot of set-pieces, but we were just lacking that extra cutting edge. Frank Kramer (Greuther Fürth): It's hugely satisfying to win a derby, especially here to our bigger neighbours. We played very intensively and defended our goal with a lot of heart. We were rewarded for our efforts. Thomas Schaaf (Werder Bremen): I can't understand a performance like that and it's hard to imagine a team competing worse than we did. You've got no chance of winning if you play like that. I'm massively disappointed. Dieter Hecking (VfL Wolfsburg): After we got hammered 6-1 by Bayern in midweek, I can only say good things about this game. We scored the goals at important times against opponents who aren't brimming with confidence right now. We've got 37 points now, so relegation is off the agenda. Mirko Slomka (Hannover 96): Bayern were exceptional today. We had no chance of holding them at bay at the back. We had a lot of difficulty, even in the most insignificant of challenges. They were better in every aspect, so the margin of victory is justified. Jupp Heynckes (FC Bayern): My players once again showed that we don't have a second-string team, only a first team. They just enjoy playing football and have a great attitude. Every one of them was motivated, we combined well together, were well disciplined and scored some fantastic goals. We laid the foundations for such a big win in the first half. Jürgen Klopp (Borussia Dortmund): Only rarely have we started a match as well as we did today. The 25 minutes after our early goal were fantastic, but then we lost our way a bit. Overall though, it was a perfect day. Thomas Tuchel (1. FSV Mainz 05): Dortmund deserved to win. Their early goal didn't affect our game and my team did well in between both goals, but we didn't have the necessary quality in attack. Lucien Favre (Gladbach): We missed too many chances to score a second, but we can take a lot of positives from this game. We deserved to win it. Markus Weinzierl (FC Augsburg): We fought really well in the second half, but we made one mistake, which was decisive. I can understand why they got a penalty, but the red card was too much.